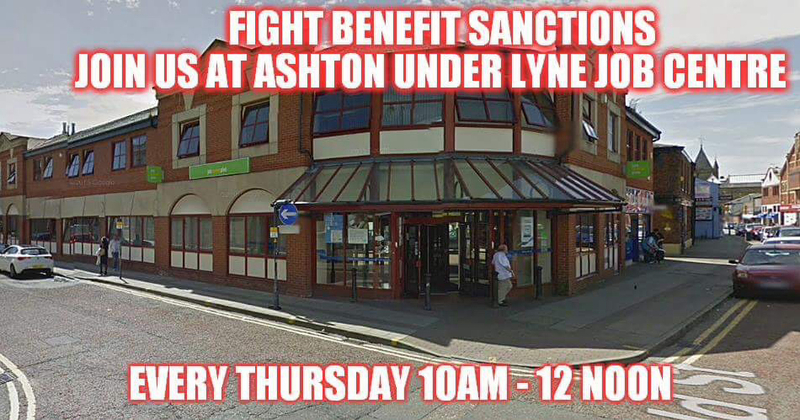 Last weeks demonstration was eventful to say the least, there must have been an even bigger wave of negativity blowing through Ashton Under Lyne Jobcentre, which it seemed was larger than the normal one circulating. Within minutes of arriving we were alerted to a situation that was developing inside the doorway of the Jobcentre. A man, obviously distressed was shouting for help. He was very agitated, the DWP receptionists and the G4S security guard were not helping the situation at all. They were exacerbating it, making you man feel completely helpless. Their idea of “helping” was to stand there, one with arms folded, the other saying I’m on the phone to the police. They were not interested at all in what he was upset about. Get him out quick was their attitude. He stormed out of the building and I ran after him, I was worried that he would put himself at risk in some way, and I also wanted to let him know if I could help. 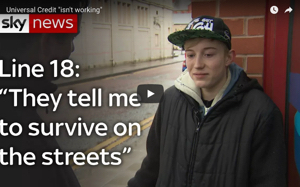 He explained that he had been made homeless, he was on high rate ESA payments and he was anxious because he couldn’t access his money due to having no identification. To remedy this his bank suggested that if the Jobcentre would print off a very simple letter stating who is is then he could access his money. Now I already know that the Jobcentres don’t as a rule print off letters, but there will be special circumstances where this could be allowed. Anyway, I’m not sure if there is an actual ruling about this, or they have just stopped doing this now. Either way it’s a terrible situation which could be easily prevented in the correct, polite manner. I told him that I would go into the Jobcentre and ask the manager or supervisor if there was anyway that this gentleman could be helped. I walked into the building and was met by the same two men, both with arms crossed. They said ‘we aren’t dealing with you because you are part of the protest’. I explained that I was there in my personal capacity and was trying to diffuse a situation that really didn’t need to have happened, that this gentleman was vulnerable and therefore by denying him this simple request thry were preventing him from accessing food, heating and the basics needed to exist. Their answer was “we don’t care”. This is not an unusual scenario by any means, however I felt compelled to inform readers that this happens everyday at Jobcentres up and down the country. Denying a vulnerable man access to his money knowingly controvenes basic human rights acts. So arrogant are they, that they are beyond caring. I also wonder how once normal caring people can turn into heartless, uncaring drones. One thought is that they become indoctrinated by the whole system and their working environment that their humanity button gets turned off. The gentleman returned later and came up to me and shook my hand. He said thank you for helping me, and he appreciated it. The police had caught up with him and asked him if he was ok. He said no, and they asked him if he was going to apologise to the Jobcentre staff. His reply was never, if they had listened it would never have happened, however he said he was going to go back and to thank that lady that helped him which he did.He’s been in my thoughts all week and I hope that he’s ok.
Dear Mr Crabb, regarding the real Daniel Blakes out there. My latest Morning Star article and a message from Mr Ken Loach himself. Heartbreaking. My gosh I hope that man is okay. I wish I was suprised by this post but sadly I’m not. This attitude is rife in JCP and council benefit offices across the country, rudeness, lack of respect and a total disgust for the people that these inadequate little jobsworths are paid to help. Whilst I would never wish mis-fortune on most people I pray for the day that this blinkered, self satisfied crew are subjected to a nice long spell of their own medicine. Not a celebrity stunt type experience, but the complete loss of hope and utter humiliation that the unemployed, sick and now lazy UC recipients are treated to daily. Oh yes. The DWP is now The Department of work and punishment until death. The poor man, I truly do hope he’s alright and has access to his money now. Thank you for trying to help him and please let us know if you see him again. Extraordinary that the police asked this gentleman if he was going to apologise to the Jobcentre staff ! By the sound of it, it was the staff that needed to make the apology. Oh yes I think that they should be the ones apologising to him for denying him his rights under the equalities act!